The new design adds 5 knots of speed performance. Fabio Rota at the helm. Lee Marine in Phuket recently hosted Fabio Rota, Production Coordinator Powerboats from Premier Composite Technologies, Dubai. 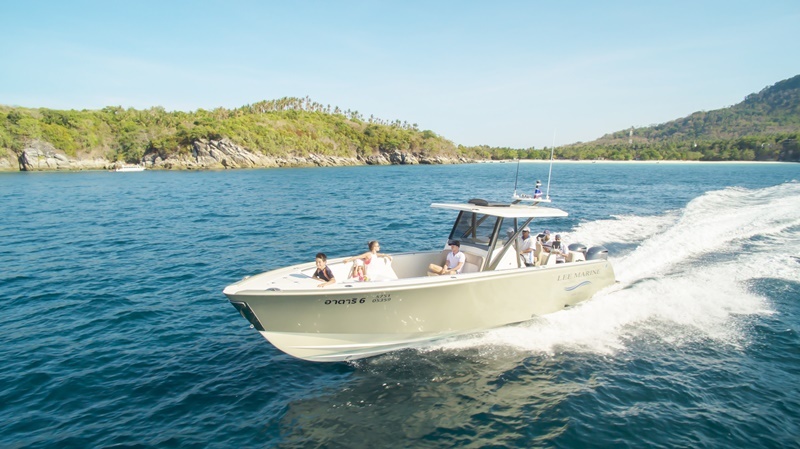 The Lee Marine team, with Fabio at the helm sped across Phang Nga Bay on Atari VI, Lee Marine’s own Premier 38 (P38) demon. When meeting Fabio Rota, humble as he seems, you are taken on a journey that encompasses what he best knows: SPEED – as in swiftness or fastness. Adrenaline-filled Fabio is pumped when it comes to getting the most out of his Premier powerboats. He is a seasoned professional with strong knowledge of the use of composites in building speedboats. Premier Composite Technologies (PCT) is a leading global supplier and manufacturer of advanced composite components for architectural design, transportation, aerospace, marine, oil and gas markets. “PCT is the only company in the world that makes production standard carbon boats”, says Fabio. PCT has built several high performance custom racing yachts. Some of these yachts are performing extremely well in competitions around the world. This technology by PCT, in the 2016 Rolex Sydney Hobart Race, saw incredible success. Three high-profile, high-performance race yachts built using PCT’s hi-tech construction, completed the demanding 628 mile race course, securing standings in the top finishing fifteen yachts. This is a remarkable achievement, considering that over the course of the race – and with a tremendously threatening first night at sea – 25 per cent of the racing fleet withdrew from the race. Mention SY Rebellion – Carkeek 40 MKII to racing enthusiasts and you will hear that these yachts are aptly named as Premier’s: Grand Prix Custom edition. That is the sailors’ side of speed. PCT is committed to building boats for speed and performance. After enjoying much success with their sailboats, PCT has entered the power boat segment with the launch of the P38, a finely tuned, sleek design power boat capable of high speeds reaching 60 knots. “Performance depends on the experience and ability of the pilot at the helm of the boat”, said Fabio, having reached speeds in excess of 125 knots whilst out on sea trials with the PCT marine team. Amazing, considering this is not far off the world speed record of 170 knots. 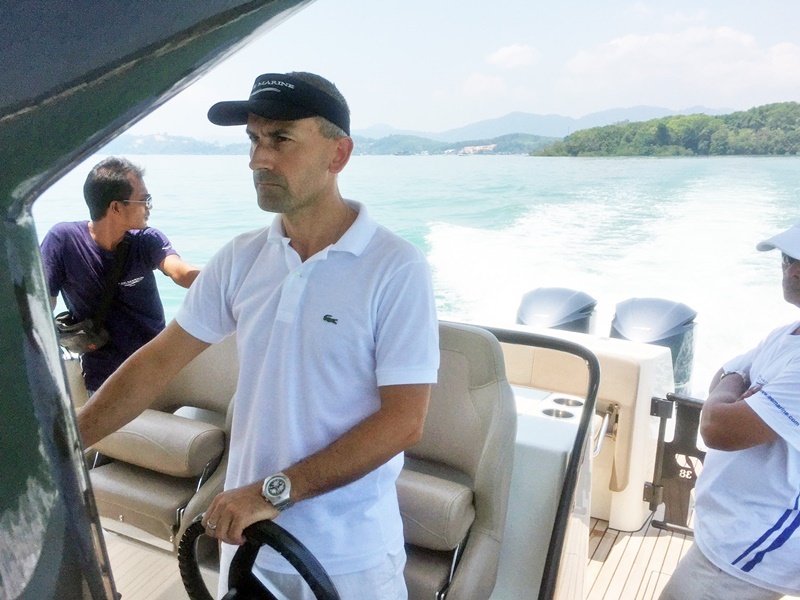 Fabio’s experienced helming was evident when the Lee Marine team in Phuket went out on the bay. He coaxed higher speeds than ever seen on the Atari VI, their own P38. Inseparable in his mind is Premier’s technology combined with speed. He persistently fine-tunes the products at all levels, in the factory and on the water, insuring each model lives up to its well-earned reputation as a “Ferrari of the sea”. He is constantly looking, listening, waiting, meticulously adjusting and pushing for the highest possible performance. Needless to say, the new breed of lightweight, sea-speed machines is here. 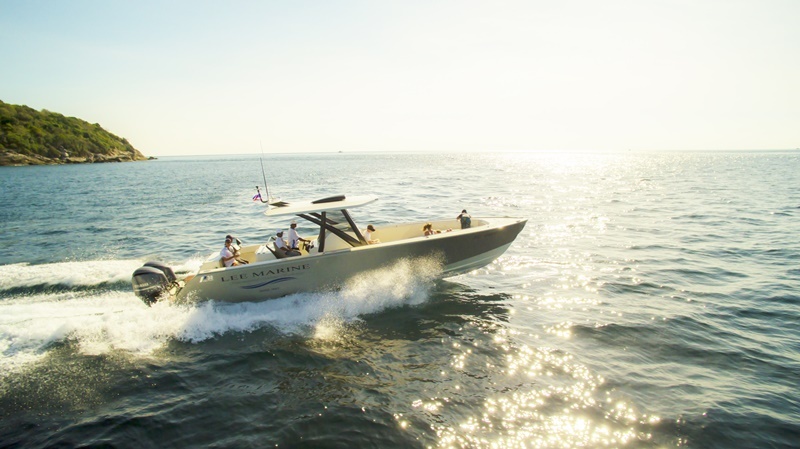 Designed by Farr Yacht Designs, the P38 performance speedboats are built using the latest technology by PCT. The hull and deck are infused carbon/foam composite structures, while a full length carbon/glass chassis join the hull and deck together. A carbon fibre structure supports the carbon composite hardtop. GRP and infused carbon composites are combined to increase rigidity and to save weight. Powered by up to three, 350 horsepower engines, the P38 comfortably climbs in excess of 60 knots – one of the fastest in her class. Hull design is most important on any boat striving for speed. Fabio’s long experience with boat hull designs is another real strength he possesses. On the P38 drawings, one of his first Premier assignments, he completely removed the 10 centimetre deep and 4 metre long keel. Then the rounded corners on the sub-structure were replaced by sharp corners. More important than the newly-created visual was the incredible addition of 5 knots of speed performance to an already fast boat. These are revolutionary designed boats. The newest Premier 38 launches early next year with performance up to 70 knots powered by three Mercury Verado 400 HP engines. The Premier 61 (P61), when launched mid-2016, will carry the status of the longest, centre-console, outboard boat available in the market. The P61 features include a proper cabin and speeds that can easily surpass 70 knots (engine variant). Firm plans are underway for the Premier 55 (P55) to debut later this year. Following this, the Premier 29 (P29) and Premier 45 (P45) are on the drawing boards with 2017 availability. PCT’s ground-breaking, fresh, new designs with low maintenance and high performance are perfect for Asian waters. 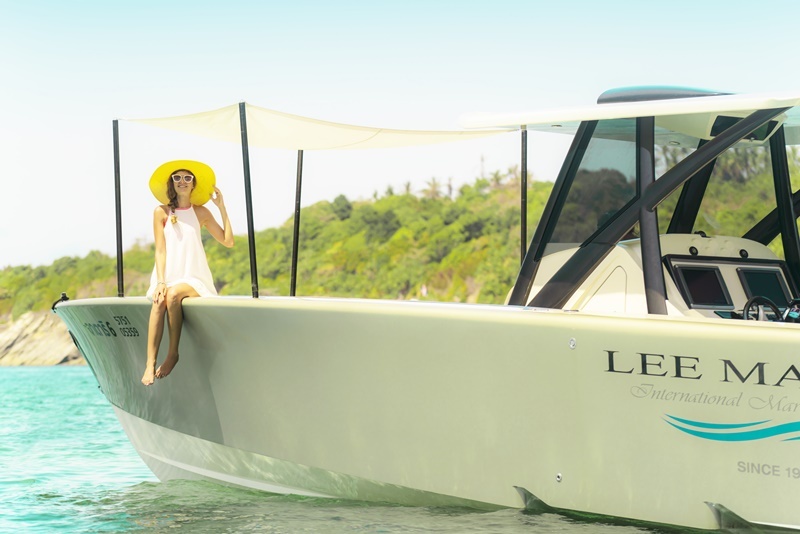 The new range of centre-console powerboats from Premier Composite Technologies is available soon at Lee Marine International Marine Brokerage. Lee Marine’s own P38, is soon ready for day charters around the islands of Phuket. Those interested may contact for a no obligation sea trial – you will not leave disappointed.